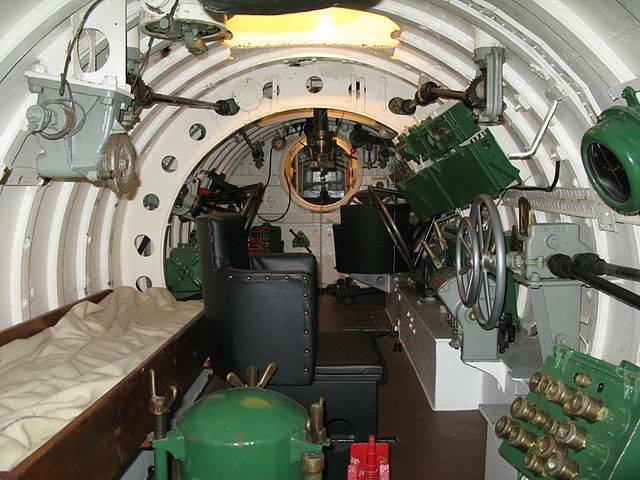 There were a number of different midget submarines employed during World War II with their main objectives being to infiltrate ports and lay explosives on or under enemy ships and coastal reconnaissance and hydrography. 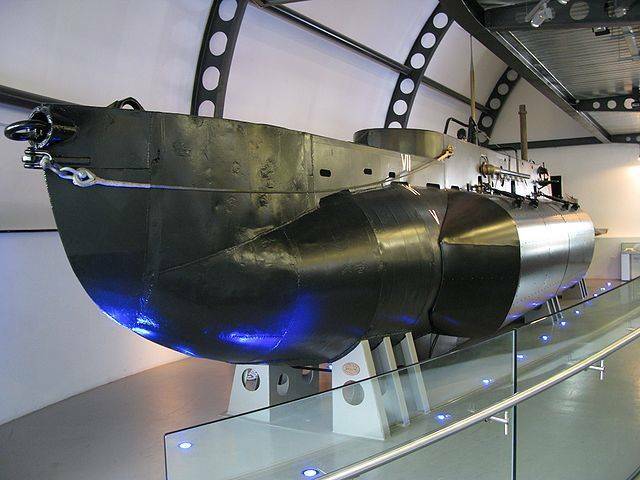 One of the most successful midget submarine programs was the X-class developed by the Royal Navy. The X-class was specifically developed to attack and sink Nazi battleships KMS Tripitz, KMS Sharnhorst and pocket battleship Lutzow which were frequently docked in Norwegian ports. The X-Craft was about 51 feet (15.5 m) long, 5.5 feet (1.68 m) in maximum diameter and displaced 27 tons surfaced and 30 tons submerged. 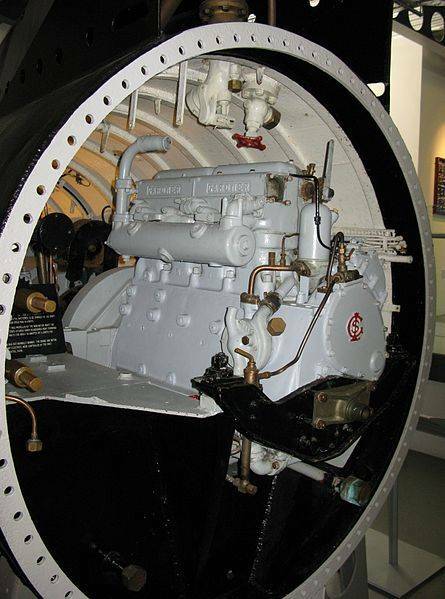 Its propulsion system was governed by a 4-cylinder Gardner 42 hp diesel engine, and a 30 hp electric motor, giving it a maximum surface speed of 6.5 knots (12 km/h), and a submerged speed of 5.5 knots (10.1 km/h). 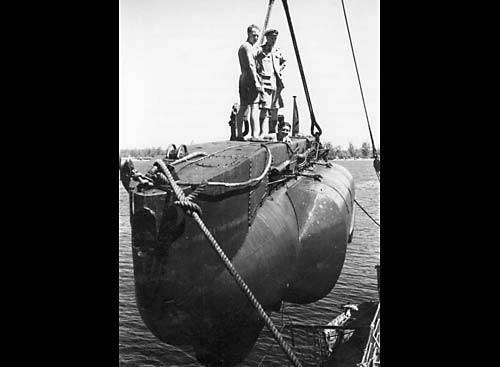 The crew was initially composed of three members, the sub commander, a pilot and an engineer with a diver being subsequenly added, along with the addition of an airlock, known as the wet and dry compartment. 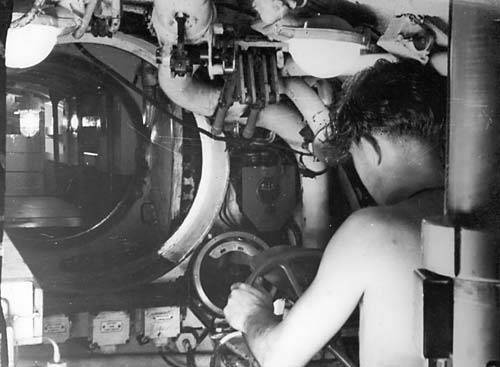 The engineer, usually a Navy Chief Petty Officer, operated most of the machinery in the vessel and did all the mechanical and electrical maintenance. The weapons on the X-Craft were two side-cargoes - explosive charges held on opposite sides of the hull with two tons of amatol in each. The intention was to drop these on the seabed underneath the target then escape. The charges were detonated by a time fuse. 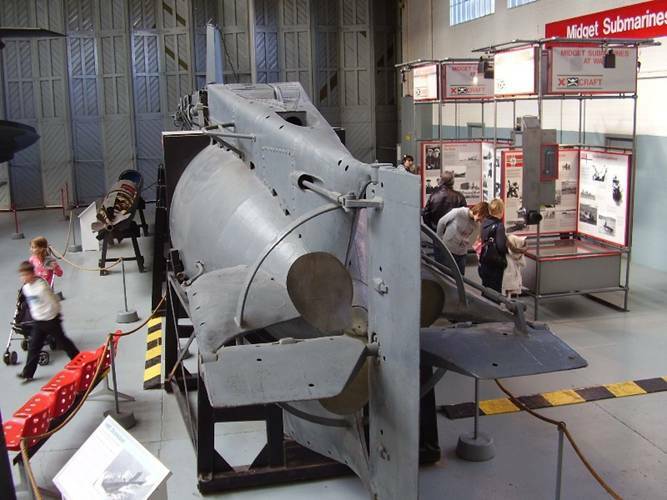 Various development craft were built before it was felt that a realistic weapon had been produced. 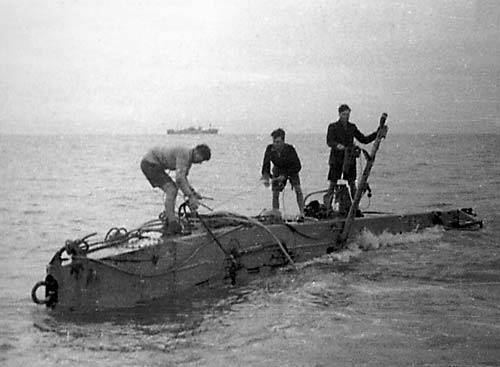 The first operational craft was HMS X3 (or HM S/M X.3), launched on the night of March 15, 1942. Training with the craft began in September 1942, with HMS X4 arriving in October. In December 1942 and January 1943 six of the "5-10" class began to arrive, identical externally but with a completely reworked interior. These operations were part of a longer series of frogman operations, see human torpedo. Their first deployment was Operation Source in September, 1943, an attempt to sink German warships based in Northern Norway. 6 X-Craft were used, but only 2 successfully laid charges (under the German battleship Tirpitz); the rest were lost, scuttled or returned to base. The Tirpitz was badly damaged and out of action until April 1944. X-Craft were also involved in the preparatory work for Overlord. 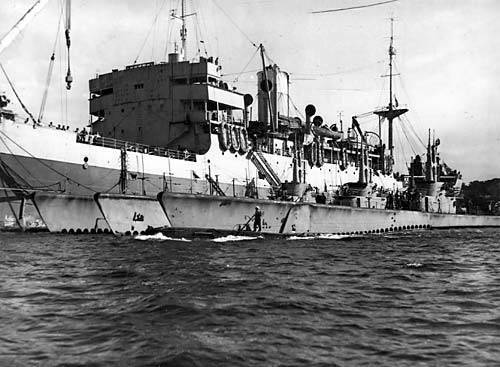 Operation Postage Able was planned to take surveys of the landing beaches with HMS X20 spending four days off the French coast. Periscope reconnaissance of the shoreline and echo-soundings were performed during daytime. Each night, X20 would approach the beach and 2 divers would swim ashore. Soil samples were collected in condoms. The divers went ashore on two nights to survey the beaches at Vierville-sur-Mer, Moulins St Laurent and Colleville-sur-Mer in what became the American Omaha Beach. X20 and X23 acted as lightships to help the D-Day invasion fleet land on the correct beaches (Operation Gambit), as part of the Combined Operations Pilotage Parties (COPP). 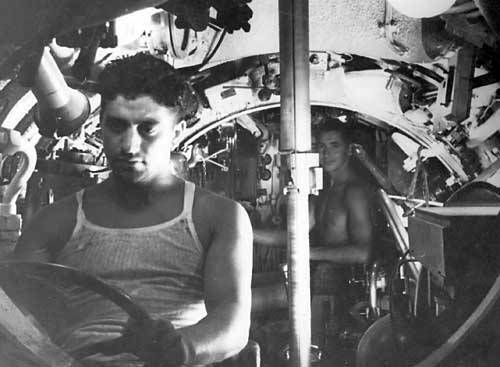 Living conditions in the X-Craft were extremely harsh, yet some diehard crews managed to operate for a couple of days off enemy shores. 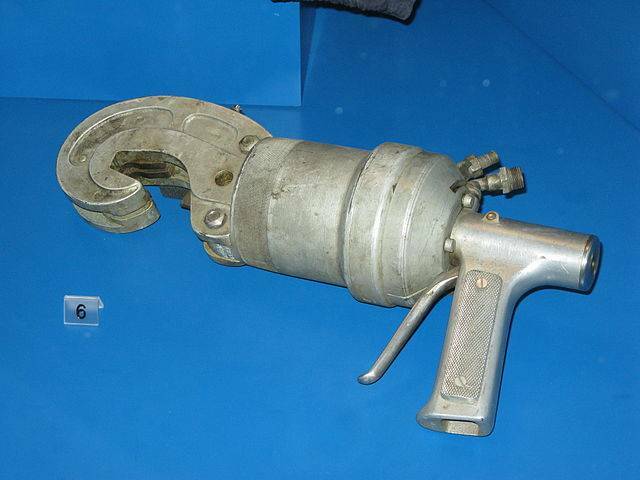 Hand-held net cutters used for penetrating in harbors protected with submarine nets.